There’s still no magic pill for weight loss, but taking a multivitamin might be the secret to a slimmer YOU! In a new study of more than 80 obese women in China, those who took a multivitamin once a day while continuing to eat their normal diets, lost in average about 1.5kg over 6 months. And those who took a placebo lost nothing. The findings reported in February 2010 in the International Journal of Obesity, linked vitamins and minerals to weight loss. But scientists don’t know yet which vitamins and minerals exactly have the biggest influence over appetite and weight control. – Calcium seems to help: Clinical trials have shown that consuming 1200 milligrams of calcium daily can boost weight loss by up to 60 %, most probably because it binds to fat in the gastrointestinal tract, which reduces absorption of fat in the body. This works best for people who are not getting enough of this mineral. – Vitamin D deficiency contributes to weight plateau, and taking injections or pills of that vitamin boost your weight loss! Other nutrients are also beneficial. 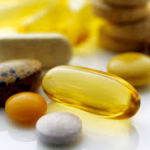 Women In the previous Chinese study who took multivitamins also lost weight. This explains that when your body is low in vitamins and minerals, your appetite increases, making you eat more to replenish the nutrients you are missing. That’s why taking a daily multivitamin supplement will keep your appetite under control! Now honestly, the best way to get these nutrients is surely from food directly. But when dieters cut back on calories, they are more likely to miss some important nutritional requirements. Always ask a dietitian before taking any multivitamin. Toxicity can also be harmful.